Muftin was about to protest but the female bird had already risen into the air. Muftin glanced out over the raging water, saw Maxine flapping towards a bend and chased after her. Seconds later the dragon and their friends disappeared behind the canyon’s twisting wall. If it wasn’t for the raging water below and howling red vapin above, the flight would have been easy. There was no wind and the temperature was cold rather than freezing. Muftin flew in beside Maxine. “What now?” he called. Muftin clamped his beak shut and resisted a reply. He glanced across and compared his companion with his human friends. They were mainly female and could cope but with Maxine, it seemed different. “They’re as different from ordinary humans as we are from dumb birds.” Maxine replied. 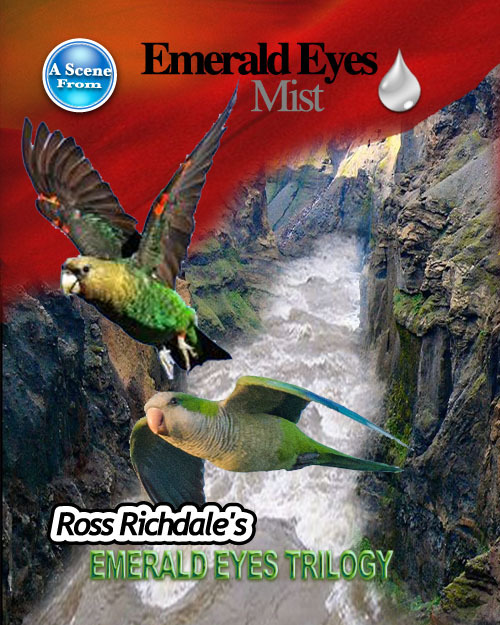 She veered left to avoid a jutting cliff and gave a wee squawk as spray from the river hit them. Maxine fluffed up her feathers and flew closer to Muftin. “We’re a good pair, aren’t we?” she said softly. They flew on, wing tip to wingtip, sandwiched between two raging torrents. Below, the rapids became more savage while the sea of red cloud continued to float above them.